east side bride: How much should we spend on wedding bands? We would like to get wedding bands though, for the ceremony and also because it would be nice to have some sort of signifier of our marriage. As you probably guessed, we don't want to drop a ton of money, but would like something that will last, won't discolour or break, pass down to our kids etc. What type of metal should we be looking for? How do we know if its good quality? In what price range? A few hundred dollars each, or is that unreasonable? Gold is the stuff that heirlooms are made of. 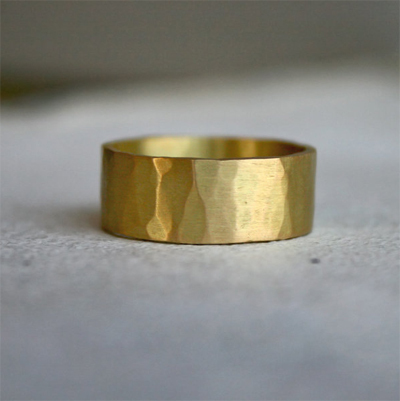 Depending on the size and width of the ring, and the type of gold you choose, you can expect to pay anywhere from $198 (for Satomi Kawakita's thin band, which I love) to $1200 (for Sarah Perlis's 8mm wide square hammered band). Silver is a lot cheaper, but it tarnishes easily and won't hold up to years of wear. It's easy if you have a little time to do some hunting to find something that will work. We were very much like you guys and I, like my mother, was never into the corny bling bling that is so associated with getting engaged or married. We went with simple white gold bands and I think we spent a total of just under $500 for both of our bands. Of course this was 7 years ago! Also, I'm going to disagree with ESB and say silver isn't that hard to take care of (simple white toothpaste cleans it right up) and if you're not too hard on your jewelry it can last a long time (still have a silver and turqouise ring of my great grandmother's). yes, gold is the way to go. i had to get a new band recently to fit my sausagey pregnant fingers. we opted for a vintage band, because i like the idea of my ring having a bit of history... even if i don't know what that history is. also, since i already have a regular wedding band (also vintage), we didn't want to spend too much on a new one. i got a thin simple gold band with some lovely etching from the 40s for about $120. the price of gold has definitely skyrocketed these days, but there are deals out there if you guys are on any sort of budget. cookies, platinum is softer than gold. @lauren I knew I would eff this one up. Love that first band. 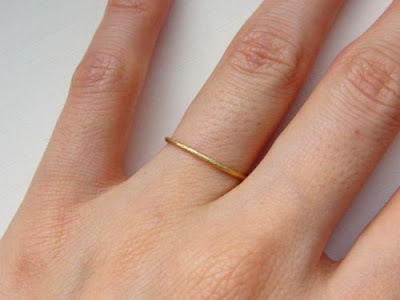 Sweet and simple but most certainly reads as "wedding band". I wouldn't rule out platinum though if you are not a gold person. I have an antique engagement ring and wedding that are both platinum and understated and I love them. If that is the kind of look you are in to you can find stuff for reasonable prices on ebay. If you want to spend a little more, look at doyledoyle.com or eriebasin.com Both stores are fun to go to in person if you live in NY. I got my wedding band at a pawn shop for £18 - from reading the assay marks on the inside, it turns out it's from the 50's, which I love. It's very similar to the thin band ESB posted, just a wee bit thicker, and I am pleased as punch with it! I love a simple band of gold, and don't see why it needs to be brand new - i love jewelry with a story that I can add to! Mine was from a jeweller who sells vintage stuff, a Victorian slim gold band, and it wasn't expensive. Vintage is indeed awesome and affordable. Rubylane.com and www.marleneharriscol.com are two other sites that have lots of bands to choose from. As for new bands, I love this one from Kate Szabone: http://www.etsy.com/listing/62121699/14k-gold-band-faceted. It's also available in a hammered texture. My band is this one in yellow gold: http://www.helenficalora.com/ring%20pages/pg_StructuralBandBand1.htm There are lots of good options on her site. As you can see, the hunt was at least half the fun for me. . .
And p.s., I'm super happy I went with yellow gold. I'd also add that they have more jewelry than is represented by their website...so yeah! definitely stop by! WOWZA. that gold hammered ring is beautiful. It was three weeks before our wedding and we both realized we may need rings since part of the ceremony includes blessing the rings. Whoops. Anyway 50 bucks, it's light which is great since he isn't used to wearing a ring and you can always upgrade later. Or not. I got mine from this etsy seller, 360JewelsElite: http://www.etsy.com/listing/61983085/14k-solid-gold-ring-18k-yellow-gold. It's only $95 and looks awesome. My husband got a titanium one from titaniumknights on etsy as well: http://www.etsy.com/listing/65305422/titanium-ring-or-wedding-band-narrow. Only $35 and he loves it. Have to second titaniumknights on etsy, especially if your guy isn't used to wearing rings. Titanium is incredibly light and durable, and I don't think it looks worse than gold - also, some golds you have to get replated over the years, whereas I don't think you have to for titanium. (Also titantiumknights gave us spectacular service and the ring itself is so gorgeous and incredibly smooth on the inside - I want one for myself now!) I think it set us back about $170? But that was with some fine detailing work in silver and gold within the titanium. The price of gold has gone through the roof, so keep that in mind. My ring was about $250 LESS than his ring, and mine had bling. There was a time when bling > more gold, but that time is no more.However, while you don't have to spend $1200 on a ring (unless you want to, that is ... we splurged on rings because I DO like jewelry), definitely go for quality. I really like LaurieSarah Designs for both pretty, quality, and reasonable. I have 2 rings from there, including my (simple, gorgeous, cheap, actually-a-wedding-band) engagement ring. Most of their stuff is pretty cheap, and it's a huge selection ranging from Victorian era stuff to modern estate jewelry. I obviously missed the previous mention of Marlene Harris...oops! So count mine as seconding that! no, they don't match. whatever. neither do we. and don't even get me started on wooden rings... talk about temporary..
second- have you ever seen a beautiful titanum ring passed down through generations to be cherished forever? no. i have little use for titanium beyond my secret robot skeleton, but in its defense, i'd note that it entered the jewelry market about twenty years ago; for a hunk of it to have been treasured by generations at this point, you'd have to have a 1) really unhealthy family of 2) time travelers. i think re: titanium and the concept of heirlooms - it depends if you want something that will *look* like an heirloom, or something that you can pass down. gold jewellery does look more like an heirloom and has that historical quality. but if you want something that lasts? titanium could fit the bill pretty well, if it's to your taste aesthetically. (i have a joint in my foot that's entirely made out of titanium, and it's keeping me walking. durable enough for me!) in fifty years, we will probably see people passing down titanium wedding rings - because it's a metal gaining popularity now, in time it'll be historical. it's just that right now, it's still relatively new and so can be seen as the "trendy" or "fashion" metal. later, who knows. i'm piping back up because, as the token tree hugger, i think we should be more concerned with where metal comes from rather than what kind it is. titanium, gold, whatever...do you know how these metal are extracted from our earth? it's not a prerry picture. and i'm not even going to breach the subject of how diamonds/other precious stones and gems are extracted and sold. i love seeing all the folks on here that decided to go the vintage route, or with a new ring made from recycled metal! My husband and I commissioned an artist on Etsy to make our bands. We chose a recycled gold option (melted down from existing jewelry) and specified exactly what we wanted. They turned out fantastic and only cost us a little over $300 for both. Damn you guys are snobby about rings. My husband lost his fancy pants gold ring, so he bought an $80 titanium ring off the internet and he LOVES it. Isn't that all that really matters??? Titanium is an industrial metal and there's masses of it - not at all rare. It also can't be re-worked or re-sized, so it's never going to acquire heirloom status. It's rarity that makes platinum and gold "precious metals" and worth passing on as heirlooms. You could make each others heirloom quality rings with your own hands at a Wedding Ring Workshop - and pass them on to your kids with the story of how you got them. Go Vintage/recycled/fairtrade metal and conflict free stones. I watched a BBC documentary 'Blood sweat and luxuries' which showed terrible slave labour conditions for gold mine workers. Not nice.